I recently got an email about a new service to add my blog RSS feed to Live.com (note the new icon on my blog, if you visit it). For some time, I've been wanting to look into an AJAX-based web client for reading my blogs because I've found, like newsgroups, I just don't like having to set up everything I'm subscribed to on every computer I use. At the same time, I do want a good UI. Well, I've been putting off doing the research for it (and my blog reading has suffered for it). Today I thought I'd check out what Live.com is like as an RSS reader, so I first tested using my new link to add to Windows Live. It works and basically adds a little RSS reader gadget for my blog. So then I thought I'd check out how it'd work with all my blogs, so I got the latest OPML (based on my blog roll here) and used Live.com's import feature to import them all. At first, I was a bit disoriented because it said it imported but it wasn't showing them anywhere (I expected them to be put on the page I was looking at when I imported them). But then I found them in the My Stuff section. So I started building out my layout. I started with the default two-column, but I quickly realized that wouldn't work, so I switched to four column, which seems to be just right at 1280x1024. I knew I wouldn't want them all on one page, but I did want some categorization, so I came up with non-technical blogs, architecture blogs, and other technical blogs, one Live page for each. Then, if it made sense, I categorized by column. The results follow. This is the "Other Technical Blogs" page. This is the "Architecture Blogs" page. Now great, you may be thinking, I can use this as well. Let me warn you, there were a couple MSDN blogs that repeatedly and totally hosed IE7 (I'm running Vista B2 x64 on this box). I figured out which blogs they were and removed them from my stuff. But even doing that, IE was still having problems, and as you can see from the image below, there's a reason for that. Note the top entry. IE is running at 50%, but this is a dual-core Athlon CPU, which means on some machines it'd be trying to use 100%, and the memory usage is out of this world (350MB), even bigger than Visual Studio! Beyond the performance issues, it also has no tracking of read/unread and no notification of new posts, both of which I think are indispensible for any kind of RSS reader. Now, I understand that maybe I'm abusing what they intend for the usage scenarios to be, but why else make it possible to subscribe to RSS feeds than to be an RSS reader? As it is, the gadget is only good for limited use for maybe news services or the like where you don't care about having your read/unread tracked. I will say that it has a neat little image capture feature where it'll grab any images in the feed and thumbnail them for you, even do a fade in/out if there is more than one. It also has neat little mouseover previews, which I like. It's not totally unusuable in terms of features to be sure, but it would be nice to see a better blog reader gadget that maybe would offer some basic categorization, read tracking, and possibly some sort of notification, though I'm not sure how that'd fly given it is web based. I'm going to keep trying out Live.com like this to see if they improve it. On the positive side, this motivated me to blog about it and, in the process, try out a new blog authoring tool, WB Editor 2, based on the recommendations of John Forsythe. It has a pretty friendly interface, is easy to set up (as these things go), and it is cheap. This post is being authored with it, so if there are any issues, well, there you go, but it was easy to add the images, and it created the thumbnails for me and uploaded them along with the main images. I also like that it has a plug-in architecture that is .NET based, even if it is 1.1. So far, I like it even better than BlogJet. 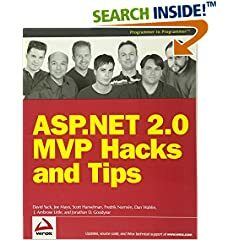 Not very long ago, Wrox published a neat little book called ASP.NET 2.0 MVP Hacks and Tips. This is a book written by Microsoft MVPs that takes you beyond the MSDN docs, beyond the reference books, and beyond what you get out of the box with ASP.NET 2.0, although there is a ton of great stuff in the box, in the books, and in the docs. The goal of the book is, as one reviewer put it, "[expand] your horizons, enabling you to not only see those horizons, but realize then, how to get past them." Another thing I like about this book (and no, it's not that I contributed to it) is that it is smallish, as computer books go, and yet packs a big punch. This is the kind of book that I like to read because there isn't a lot of fluff, and it doesn't repeat what you can find in the docs; it just gets down to learning from other people's experience. If you're an experienced ASP.NET developer, this is a great book to pick up to compliment your own experience and learning. So pick it up, give it a read, and then let us know what you think by blogging, commenting here, or publishing a review on Amazon and elsewhere. Is anyone else as frustrated as I am with the multifarious password policies you run into across systems? It seems like everyone and his brother has "the best" idea of what a strong password should be, which translates into having to keep up with N passwords and which systems they map to. That's bad enough, but then you have these people who think that making you change your password every N days is a good idea and that you can't use the last N passwords you've already used. To make it worse, some brilliant minds out there think that forcing us to have "strong" usernames is a good idea too, so you end up with something like N^N permutations of usernames and passwords that you have to track. "So what?" you say. "We've got a nifty 'Forgot Password' option on our site/app/etc.."
But I have to ask, is that really ideal? Perhaps if we didn't have to keep track of N^N passwords mapped in matrices to the N! systems we use, we wouldn't forget them so often! If all you've got for a particular system is generic profile data, that would require a very low strength password, say minimum six characters, no special chars or numbers required. Then you might have a next level for systems that keep your order history (but no financial data per se). These kinds of systems might require eight characters with at least one number. You might then have systems that store financial data, such as credit cards, but are still a commerce system; these could require eight characters with at least one number and one special character. Then there are the actual banking, trading, etc. systems, and these might require ten characters with at least one number and special character. For systems above this level (e.g., company VPN), you would want to have some kind of dual authentication with a strong password and RSA tag, smart card, bio, etc. Anyways, the point is not necessarily that these are the best specific guidelines; I don't consider myself a security expert, but I know enough to understand that what we have going on is not likely adding to our general security because in order to keep track of all these authentication tokens, we have to write them down somewhere, store them in some vault, file, sticky pad, etc., which in the end likely makes our security less, and it certainly adds to both individual and organizational administration overhead to manage password resets, fetches, etc. If we had standards like I'm suggesting that were well published, then every Joe that goes to write a new system would easily be able to put in place a policy that is both secure, appropriate for the data being protected, and manageable for everyone involved. If we only had maybe four passwords to remember, even if they're odd and funky (with special characters and numbers) or if they were pass phrases, we would have to write them down or forget them or manage getting them reset all the time. In other words, we'd be more secure and happier. And if we do have such standards, they need to be far more publicized and talked about when the subject comes up because I've not heard of them, and I don't think I live in the proverbial cave. I just finally got Windows Vista up and running on my DFI LANPARTY SLI-DR board (has nVidia's nForce4 chipset). Plugged into that are an AMD Athlon Dual Core X2 3800+ chip, 2 GB RAM, 2 Western Digital 36.7 GB 10K SATA (setup as RAID 0), and an nVidia GeForce 6600 GT (not running SLI yet), among other less important peripherals. It wasn't easy getting this going. nVidia has 64 bit Vista drivers for its chipset, but they're incomplete and the instructions they post on their site don't work for me (and others). Thankfully, someone else has put together an install guide, but even with that, it took me two tries to get it going (it didn't like my USB drive the first time apparently). The silly thing is that Vista B2 won't ask me for my drivers before it summarily decides that it can't find any information about my disks, so you have to start from an existing XP installation and run the installer from there and install on a secondary partition. I hope they get this resolved by release because I'd really like to repartition my drives and install it on my C drive. Maybe my blogging this with my specs will help others who are in a similar situation. I guess somebody thought it'd be a lot of fun to see a bunch of geeks take an early morning stroll. I was rudely awakened not long ago by what seemed to be an alarm clock, my neighbor's alarm clock, or so it seemed in my groggy, post-party sleeping mind. So I tossed the useless, decorative pillow towards the noise, hoping somehow that'd make a difference. It wasn't until the recorded voice came on telling me that it was an emergency that it crossed my mind that I might want to get up and see what the hell was going on. I jumped up or, more actually probably, crawled out of bed and tossed enough clothes on as to not scare my cohabitors and stepped out into the hallway. Most folks seemed to be in the same mind-numbed state as I because we all slowly and calmly trapsed towards the stairs, greeting each other with friendly and somehow knowing smiles. The stairs took an uncomfortably long time to descend. All the while I was thinking about how it's a good thing that it wasn't a real emergency; otherwise, well, err, umm, our studied rate of descent would not I think have sufficed. After stepping down uncounted steps, we broke through the perimeter and exited the rear of the building. It could have been a scene from Night of the Living Dead for all the energe with which we circled the building, looking inquisitively at each other and the seemingly unharmed hotel. Eventually, I came to a stop at what I thought was a safe distance when the hotel started to disassemble itself, floor by floor, starting at the top down, like a drunk man shedding his clothes to join a swimming party. No.. wait... that was just my sleep-deprived imagination trying to make sense of the events. What actually happened was that I waited and chatted with a fella that I probably otherwise would not have met until we saw folks start slowly streaming back into the hotel, past the fire trucks and ambulances (yes, those were real, surely). We stumbled into the lobby as a few of Boston's finest meaningfully slid past us, carrying what little gear they brought in with them. Now, after my legs quit burning from the strenuous ascent back up seven floors (hey, I'm not in good shape! ), I find the alluring siren call of the bed beckoning me to return to the dreamland whence I came before this brief morning adventure was so rudely thrust upon me. As the good Willy Wonka once said, "adieu. auf wiedersehen. gesundheit. farewell. parting is such sweet sorrow..."
If you're reading this and you attended my session on Monday morning at 9a but haven't yet filled out an evaluation, please do so. I've been told the room seats over 800 and it was packed, but only 208 thus far have submitted evals. I'd really like to know what EVERYONE thought, not just those few who've filled it out thus far. It only takes a minute, and you get a chance to win an XBox if you do it sooner rather than later. Info again: 6/12/2006 - 9:00-10:15, WEB301 - Accelerating Web Development with Enterprise Library. Just go to: http://msteched.com, log in, and go to fill out evals for breakouts (menu on left). It's been on my mind for some time to (re)try my hand at fiction again. I've got some experience, chiefly from my university days, but I've been feeling the urge to stretch those fictional writing muscles again. Now that I've got some publisher contacts, I thought it might be worth pursuing. Granted, they're tech publishers, but at least some of them work at houses with fiction publishing arms. Maybe they could hook me up. Then again, I thought that rather than committing myself to a book project with a publisher up front, I might try a different approach akin to the serials in the old days. In essence, I thought I might set up a site for the book and publish chapters one at a time on the site, using RSS as the notification mechanism for when new chapters are available. For those who don't mind reading online and waiting for the next chapter, I figure they could use the site and give me feedback as the book progresses. Then, once I have something that might qualify as a book, I could see if any publisher would have me for those who (like me) still prefer to read from paper pages. So what do you think of an approach like that? Would you ever read a book published serially on a web site? I ran into an odd problem the other day that I figured I'd blog for any other poor souls stricken with the same enigma. Without going into the details of why I was trying to setup the indexing service on my Windows XP SP2 box, I found that when I tried to get into it from MMC (Computer Management), it would give me an error when I tried to expand the Services and Applications node saying that it failed to initialize the snap-in for the indexing service. Searching on various combinations of the error message really didn't help, on Google or MS. Everything appeared to be in order (the service acted like it was running) except that it wouldn't run the snap-in, and when I looked at the Windows Components tab in Add/Remove Programs, it showed that Indexing Service was unchecked. Even if I checked it and clicked next (at which point it'd act like it was installing and configuring it, it would still show up as unchecked. I had also noticed in recent days that I'd occasionally get one of those application crashed, do you want to debug messages about this SearchFilterHost.exe app. When I first got the message, nothing came up for it on Google. When I searched again on Friday, I found a few indicating that it was part of Office 2007 Beta 2, which I've been running since the day it was released, more or less. I had kind of assumed that, but I just ignored the error and moved on. Well, those two things gelled in my mind to suggest that maybe it was something with Office 2007 Beta 2 that was hosing up the Indexing Service. More specifically, I suspected it had to do with the Windows Desktop Search that Outlook and OneNote 2007 prompt you to install. On this hunch, I uninstalled the desktop search, and voila, my Indexing Service snap-in worked again, as did the program I was running that wanted to use it. The state of New Jersey Department of Revenue now requires Recorded Books to collect sales tax on orders from residents of New Jersey. They base the demand on the fact that outstanding rental audiobooks (in the hands of New Jersey residents) gives Recorded Books a "physical presence" in the State and therefore we are compelled by law to collect sales tax on all orders from New Jersey. Before I moved up here, I knew that property taxes were high and that they have state income tax (unlike Florida), but since I’ve been here, I’ve heard other amazing stories about the ridiculous ways in which the state taxes its residents. This has got to be one of the more creative ones, though. They sure are creative bloodsuckers; I’ll give them that!